The strategic sourcing procedures of power companies around the globe are expected to include the attainment of renewable energy resources. Due to a shifting climate and greater demand for power worldwide, logistics companies are helping grid owners obtain the necessary equipment to commence the construction of photovoltaic panels, wind turbines, geothermal facilities and other green technologies. As the nature of the materials is particularly sensitive, transportation experts need to ensure these products are properly cared for while en route to their destinations. A quarterly report conducted by NPD Solarbuzz noted that the 2014 Q1 global demand exceeded 9 gig​awatts, about 35 percent more than in 2013's Q1. The organization predicted that the upcoming year is going to set record highs for PV panel adoption, a trend expected to continue into 2015. Apparently, Q1 of 2015 is expected to exceed 50 GW for the first time in the world's history. As manufacturers of the materials are spread throughout different parts of the planet, increased oceanic shipping traffic is expected to expedite power suppliers' global sourcing strategies. "The record demand added by the PV industry is the fifth straight year that a quarterly record has been set at the start of the year," said Michael Bark, senior analyst at NPD Solarbuzz. Bark noted that although demand during the first quarter typically sets the anticipated annual low point, deployment levels during Q1 provided an excellent means of financial benchmarking demand for the rest of the coming year. A study conducted by the Environmental Law and Policy Center reported that Ohio's implementation of renewable energies has witnessed general support over the past couple of years. 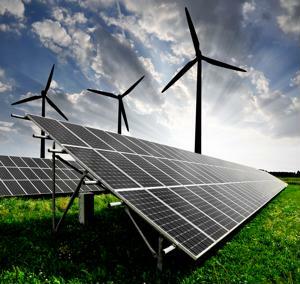 The analysis noted that approximately 107 wind power distribution and manufacturing businesses exist in the state, while about 65 solar energy companies contribute to its green technology sector. Cumulatively, these 172 organizations account for more than 9,000 jobs throughout the region. Ohio is within 600 miles of 62 percent of all United States and Canadian manufacturing locations. This position makes it easy for utilities requiring specialized wind- or solar-related equipment to obtain goods much more easily than other North American areas. In addition, surrounding states have obligated their critical infrastructures to source about 40,000 megawatts of power from renewable resources, making Ohio a necessary part of the procurement process for those looking to obtain materials.